These Eggless chocolate chip cookies are an absolute treat. Soft and chewy on the inside with a light tender crisp on the out. 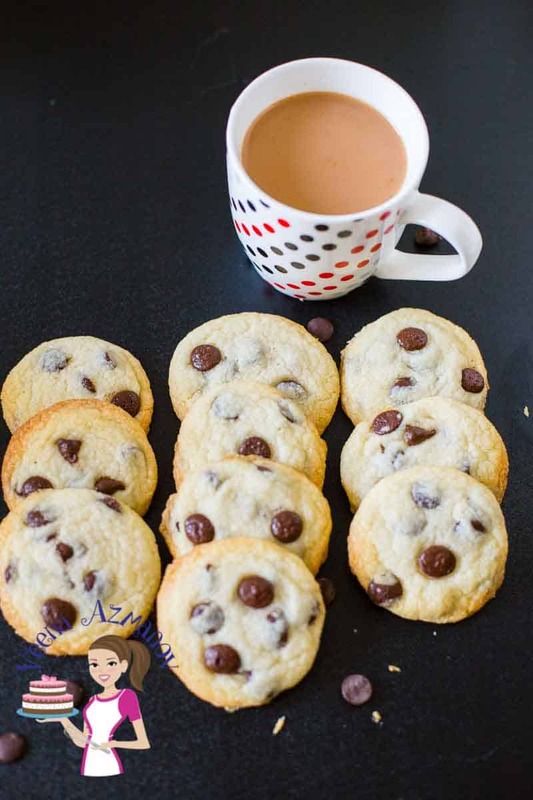 This simple, easy and effortless recipe will have you making these cookies almost every week. Since they are a great snack or even served with ice cream as desserts. And they make perfect edible food gifts for family and friends. This week I received a lovely surprise in my inbox. My blog was selected as one of the Top 10 Eggless Baking blogs by Feedspot.com!! And I even received a badge for it! Yeey!! First of all, a huge thank you to their editorial team and experts review. And mostly to you. Because it’s your support and constant encouragement that has got my blog to where it is today. Thank you!! Also, you can see the rest of the blogs for eggless baking here on this page – Top 10 Eggless Baking Blogs. 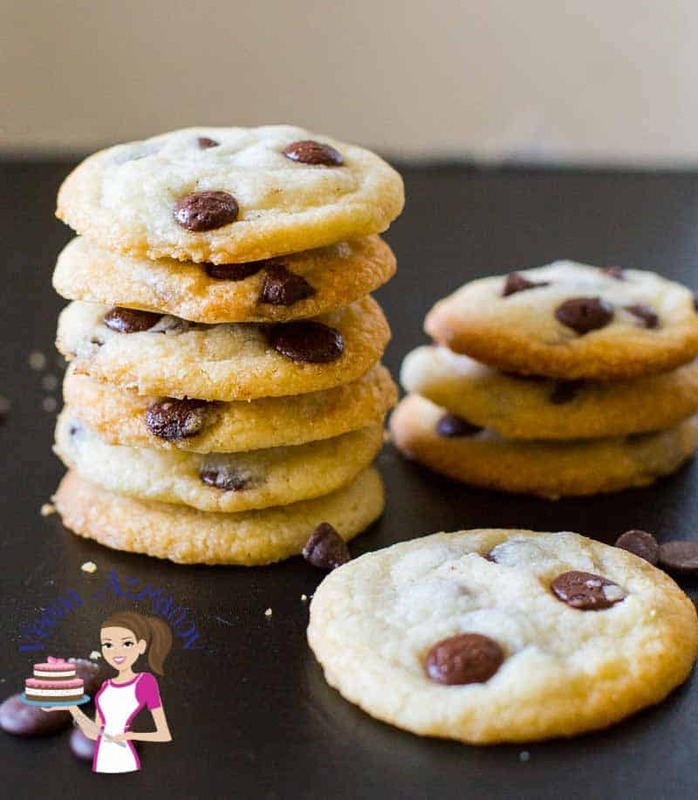 Therefore, I wanted to celebrate this awesome news with you by sharing one of my absolute favorite cookie recipes – The BEST Eggless Chocolate Chip Cookies EVER!! I didn’t say that my friends did! Two of my friends who have now turned eggless. So, they got these from me as a Christmas gift. And they raved about them. You know that feeling when someone really enjoys what you cooked? You know what I’m talking about right? So, these cookies have no eggs but they are still chewy! And guess how I ended up with this recipe? I actually forgot to put eggs in my regular chocolate chip cookies (which is also one of the most popular recipes on this blog – The best chocolate chip cookies ever but with eggs). The first time they were crumbly, not chewy. So I had to try them a few more times before I got just the right texture and taste. And the secret was to add cornstarch and yogurt (water works too). Sugar – You need both white and brown sugar. Since the molasses in the brown sugar not just adds flavor but contributes to the chewy texture as well. Cornstarch – This usually adds a shortbread kinda texture to the cookie. And yet in this case, because of the water, it actually works as a slur and adds a chewy texture. Baking powder – It’s a small amount because I want them light and fluffy but mostly chewy. Vanilla – Always a great flavor for chocolate chip. And yet if you ever want to experiment – try, rose extract… out of this world. Water – Yes believe it or not in this cookie, water works as a great substitute. And mixed with cornstarch makes them chewy. 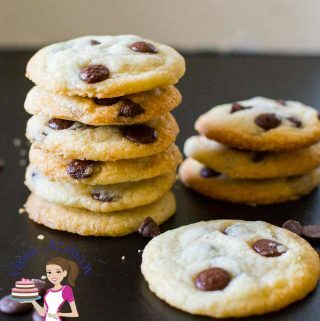 The BEST Eggless Chocolate Chip Cookies Recipe EVER! Combine together the flour, cornstarch, baking powder and salt. Lightly cream together butter and sugars until light and fluffy. This will be a soft dough. User a cookies scoop or two spoons to drop balls of cookie dough onto a baking tray. Depending on the size of your cookies and the oven temperature they take – 10 to 12 minutes. Mine took 10 minutes – watch the sides – a slight color on the sides is all it needs. Cool on a wire rack completely before you store them in a cookie jar. The BEST Chocolate Chip Cookies Recipe EVER !! Combine together the flour, cornstarch, baking powder, and salt. Depending on the size of your cookies and the oven temperature they take - 10 to 12 minutes. Mine took 10 minutes - watch the sides - a slight color on the sides is all it needs. What is the amount of yogurt? Appears to be missing from the ingredients, yes? Hi, thank you so much for the recipe! My boyfriend’s family love my cookies but his mum has never been able to try them as she’s veggie. Excited to try and make these for her before I go and visit tomorrow! I am unable to get light brown sugar here in Delhi, and I was wondering if powdered jaggery will work? I’ve been using it as a substitute for most baking but do you think I should be using more/less than the amount for light brown sugar? Any other tips? Thank you so much! Tabitha, so happy to hear you like my recipes. Do you get molasses? If you do than use white sugar and a tbsp of molasses. Jaggery is good but it may not give the same texture for the cookies. Having said that if jaggery is all you get then give it a go. I have not tied it so can’t say how it will work. It may be on the softer side. Let me know what you do and how it turned out. Those sound so good, and I love the idea to freeze the dough for later. I may drop dough balls and freeze it that way so I can make one or six at a time! I always freeze half my dough Michelle. We love fresh cookies so it really is a great time saver. Congratulations on your award!! You deserve because you are a great baker and artist. Now, for the cookies, they sound terrific and I can’t believe they are made without eggs. And I have to admit I can’t resist chocolate chip cookies. Aww thank you Marisa. You always have the nicest things to say. Thank you. I think you will love these. Thank you Denise, yes baking is indeed quite a fascinating science. I love playing with textures in cakes and cookies. I think chocolate chip on a deserted island would be so appreciated….ha.!! Me too Madhu, I love to have the options of making these with or without eggs. PERFECT!! 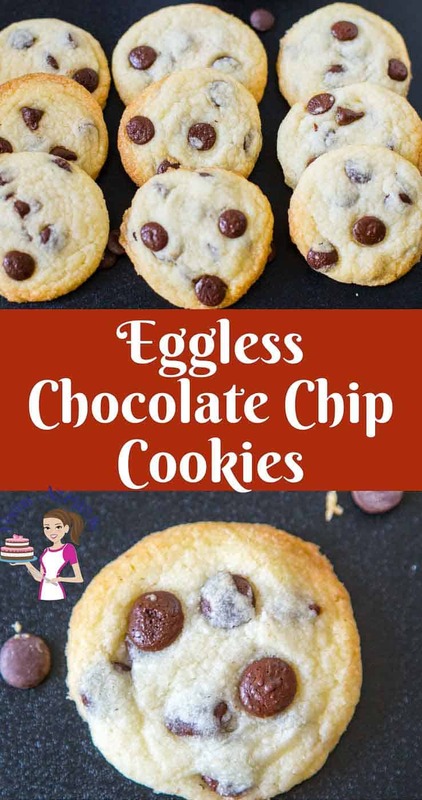 I often find myself without enough eggs or with no eggs to make cookies so this is ideal for me! Also, you know, COOKIE DOUGH. I know what you mean Jessie – I love these though we don’t necessary keep an eggless diet. Congrats Veena! You make such lovely desserts so it’s no surprise that you were chosen. 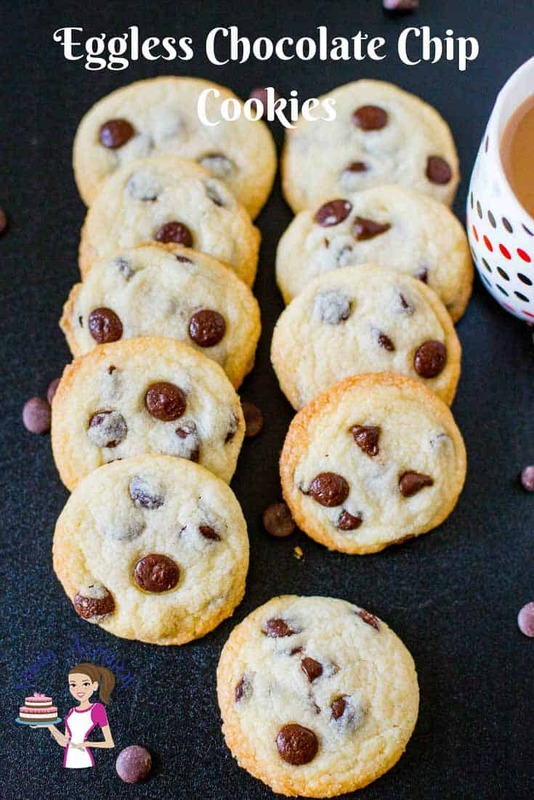 I love chocolate chip cookies and these ones look so chewy and delicious! Thank you Marie – I do love my desserts. Chocolate chip cookies of ANY version are always a hit. Perfect for snacks, dessert with ice cream….and for my afternoon latte break. These sound nice and chewy…just the way I like them. They will disappear in a flash for sure. Thank you Gloria. Yes any version of chocolate chips is always a great a treat to have a on hand. Yay congrats on your award, thats fantastic! Well deserved, you work so hard on it. 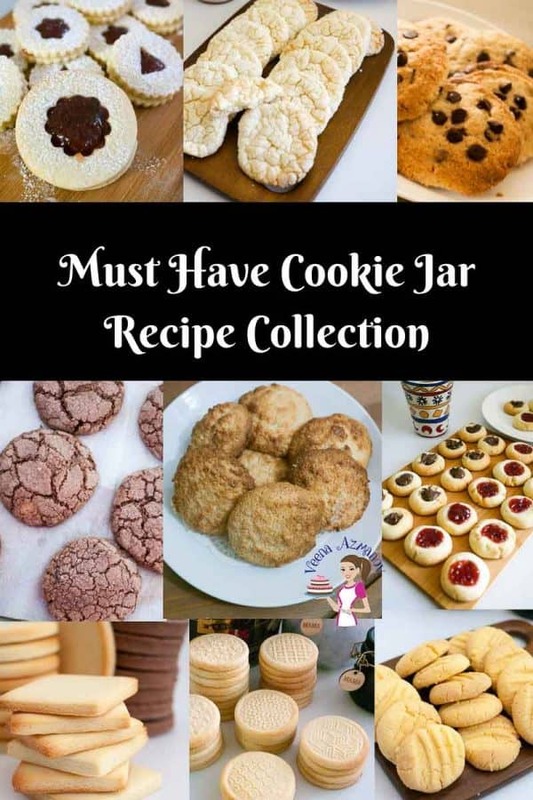 The cookies look amazing and I would not have guessed they were eggless. Thank you so much for sharing your recipes! Thank you Tina, so happ you think so. Can hardly tell that they are eggless. I have never had good luck with egg less chocolate chip cookies. These cookies look absolutely marvelous and you have nailed the egg less version. I am going to give this a try and see if it works as well for me. 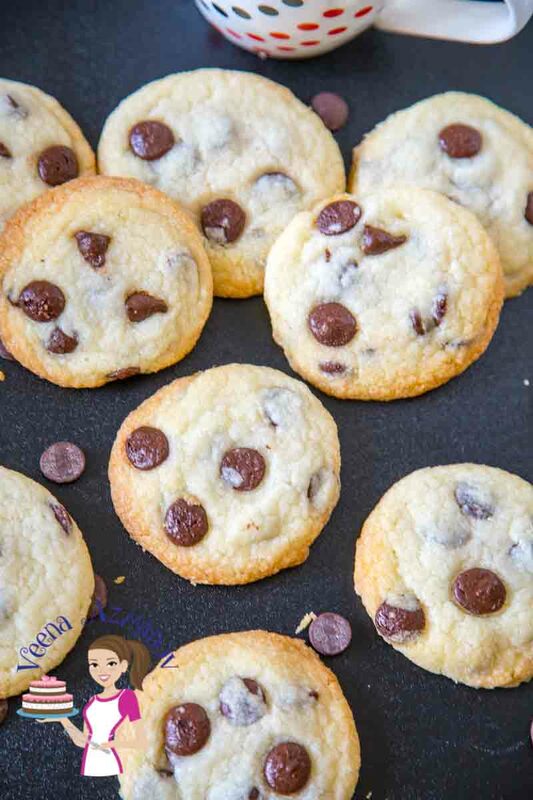 Great recipe, my son is a fan of chocolate chip cookies, I haven’t tried an eggless version. always afraid that cookies will be come crispy. But your recipe sounds good. I know cornstarch make cookie chewy. Thank you Swathi. Yes, without the water they become crisp not chewy- amazing how important that water is. These cookies look and sound fabulous. You’d never know by looking at them they are egg less. I didn’t know you could substitute with cornstarch & water. Need to give this a try! Exactly Stephanie. I switch between these and my regular chocolate chip cookies all the time and guess what – the kid or Ziv never realize the difference.